This is so sad. The team does not look good. The team is losing games. Yet every week the Jaguars decide that they want to post the Monday press conference on Facebook Live. 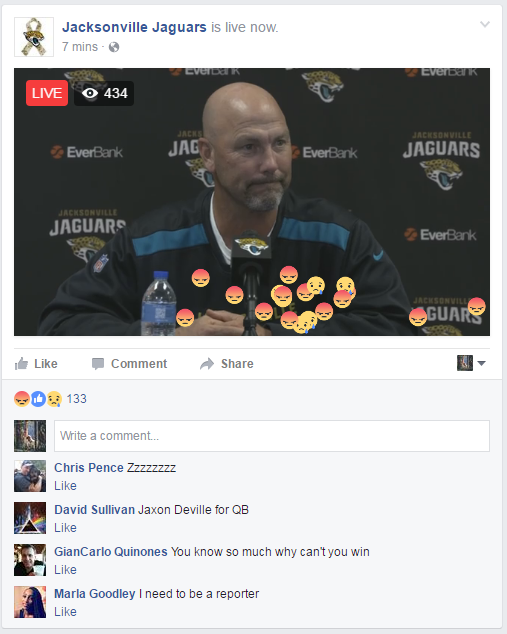 Head coach Gus Bradley has not lived up to expectations and as with Facebook Live, fans can react with emojis. It’s sad. It’s anger. It’s comments with irrational thoughts. The idea of Facebook Live press conferences is great. But when the team is 2-8 and looking awful, this is what you get. If they keep losing, expect more of this every Monday. Nobody on the social media team realized what they were doing.